French President Emmanuel Macron delayed a planned tax increase on fuel, handing a victory to a grass-roots protest movement that has massed across France to challenge his agenda. Faced with another weekend of destructive protests by the “gilets jaunes”—or yellow vests—Prime Minister Édouard Philippe told a news conference Tuesday the tax hike would be pushed back six months. The worst riots to hit Paris in decades erupted during antigovernment protests Saturday, leaving the city’s shopping and tourist center dotted with burning cars and broken storefronts. Protesters vandalized the Arc de Triomphe, rattling Mr. Macron’s administration and the nation. “No tax is worth threatening the unity of the nation,” Mr. Philippe said. The protests have become a test of Mr. Macron’s resolve to forge ahead with his broader agenda, particularly his pro-business overhaul of the French economy. Tuesday’s concession marked the first time the Macron government has blinked since the former investment banker took office in the spring of 2017. The French leader has eschewed the consensus-building approach of his predecessors. Instead he wielded his executive powers and his large majority in Parliament to defy the political opposition, unions and other groups as he stripped away job protections and wealth taxes that help underpin France’s social model. In recent months, however, Mr. Macron’s approval ratings have plummeted and lawmakers in his own party have begun calling on him to display flexibility as the gilets jaunes protests have piled up. Polls show that more than 70% of the public supports the gilets jaunes. It remained unclear whether the delay was enough to thaw tensions. On social media, gilets jaunes were preparing to protest for a fourth consecutive weekend. “It’s a small victory because he is finally backing down,” said gilet jaune David Roig, a 29-year old taxi driver. “But what we want isn’t a delay. It’s the cancellation of the planned tax increase,” he added. The movement largely has rebuffed the government’s appeals to negotiate, discouraging any representatives from sitting down with officials. A few gilets jaunes who were preparing to meet with Mr. Philippe Tuesday canceled after receiving threats from more radical factions of the movement. While the fuel-tax proposal gave birth to the gilets jaunes, the movement has since embraced a broader antigovernment agenda, accusing Mr. Macron of being a champion of the rich at the expense of the working class. The tax proposal, aimed at simultaneously raising revenue and cutting automobile pollution, was a hallmark of Mr. Macron’s technocratic leadership style. Economists say such consumption taxes that reduce pollution and other harmful effects are an efficient way for the government to raise revenue. The technocratic approach, however, alienated swaths of French people who live in rural areas and rely on their cars to reach their jobs in urban areas. It also compounded the public’s perception that rural France has borne the brunt of globalism’s impact, as forces such as e-commerce and big box retail have left villages and towns hollowed out. 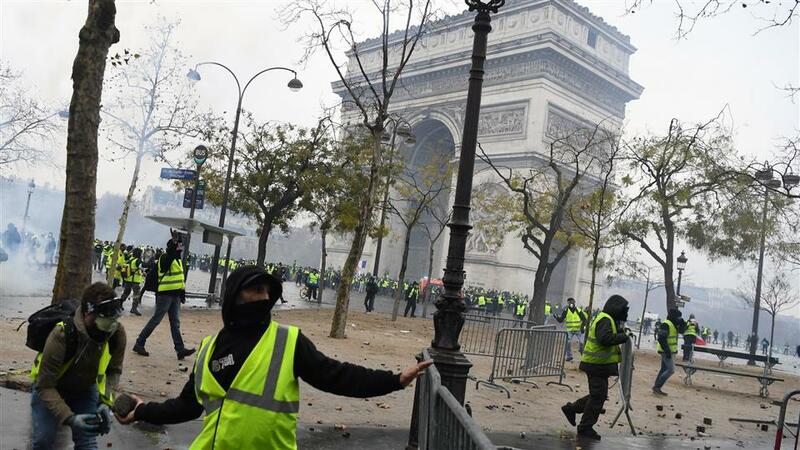 The result: hundreds-of-thousands of people flocked to Paris and other cities around France, blocking roads, clashing with police and demanding the resignation of Mr. Macron. On Tuesday, Mr. Philippe called for a nationwide “consultation” to discuss fiscal policy and public services outside of major cities. He also said there won’t be any increases in the price of natural gas and electricity over the same six month period. “The government has made proposals. Let’s talk about it. Let’s improve them, complete them, I am ready for it,” said Mr. Philippe.